Each week, Big Issues focuses on newly released comic books of significance. This week, it’s the debut lineup of Monkeybrain Comics: Bandette #1 by Paul Tobin and Colleen Coover; Aesop’s Ark #1 by J. Torres and Jennifer L. Meyer; Amelia Cole And The Unknown World #1 by Adam P. Knave, D.J. Kirkbride, and Nick Brokenshire; October Girl by Matthew Dow Smith; and Edison Rex by Chris Roberson and Dennis Culver. The ambitious digital initiative takes advantage of the shifting comic-book landscape, and gives creators a new outlet for getting their stories to a wider audience. This past April, Chris Roberson announced his departure from DC Comics because of ethical concerns regarding the company’s recent business practices and mistreatment of creators. DC responded by shelving his arc of the Fables spinoff Fairest, but Roberson has come out on top in this feud, leaving the corporate entity behind to pave new ground. This Monday, following a healthy stream of Twitter buzz, Roberson unveiled Monkeybrain Comics, a digital-comics imprint of the independent publishing company he owns with his wife, Allison Baker. Affordably priced at 99 cents for 13-to-16-page issues and $1.99 for the 31-page Amelia Cole And The Unknown World, all five launch titles can be purchased together for $6, which is the same price as two 20-page books from DC or Marvel (if you’re lucky). The value is certainly there, but so is the quality. Some titles are stronger than others, but each debut issue is a satisfying read that builds interest for the second installment. The launch’s two standout titles are Bandette, written by Paul Tobin and drawn by Colleen Coover, and Matthew Dow Smith’s October Girl, both deeply stylized stories featuring female leads. These are the kinds of comics Marvel and DC just aren’t publishing right now. Bandette #1 is one of the strongest first issues of the year, a quirky blend of Tintin, Nancy Drew, and Robin Hood with a charming protagonist who delivers goofy monologues while stealing pencil drawings by Rembrandt. With the help of the “Rad Thai” delivery boy, her dancer friends, and a slew of adorable puppies, Bandette steals art from corrupt rich people in an action-packed, all-ages title that perfectly balances comedy and drama. Tobin introduces a large cast within the limited page count, and Coover brings so much personality to the characters that the ensemble feels immediately familiar. The ink wash of Coover’s artwork looks beautiful on a digital screen, and the panel layouts are the ideal size for reading on a smartphone. Not only is Bandette a great book for female readers, it’s easily available for 99 cents; all they have to do is download the free Comixology app. October Girl has a completely different tone than Bandette. The story follows Autumn, a young woman who yearns for the days of imaginary friends and believing Santa Claus is real. Matthew Dow Smith doesn’t attempt any significant world-building, instead devoting the issue to getting inside Autumn’s head and exploring her increasing feelings of loneliness and disillusionment. It’s the most realistic of the launch titles, capturing the boredom of Autumn’s life as she lies in bed or serves espresso at work. The quiet tone and relaxed pacing increase the impact of the curveball cliffhanger: While taking out the trash, Autumn’s childhood imaginary friend Bartleby emerges from the shadows, warning of imminent danger. Smith’s artwork has a strong Mike Mignola influence, and his atmospheric use of shadows lends the story a sense of foreboding even during Autumn’s most mundane moments. It’s unclear whether Bartleby is a hallucination or the series is going to move in a more fantastic direction, but the major draw of October Girl is seeing how that mystery develops over time. The final heroine of Monkeybrain’s launch is Amelia Cole, the mystical, dimension-hopping vigilante of Amelia Cole And The Unknown World #1, written by Adam P. Knave and D.J. Kirkbride, and drawn by Nick Brokenshire. It’s a dense book that jumps into Amelia’s story already in progress, and while it’s nice to start off with a bang, the writers have to rush the pacing to get all the information out. It’s a problem similar to the one faced by Edison Rex, written by Roberson and drawn by Dennis Culver. When Edison Rex, a stand-in for Lex Luthor, succeeds in killing Superman clone Valiant, he decides to change his villainous ways and become the new defender of Earth. The first issue suffers from shadowing Superman a little too closely, but by the end of the story, it’s clear that this book isn’t just going to rehash old Man of Steel plots. Amelia Cole and Edison Rex both read like solid pilots: The first installments are a bit flawed, but they set up promising concepts. Aesop’s Ark is Monkeybrain’s most unusual title, a series about animals sharing Aesop’s fables while sailing on Noah’s Ark, written by J. Torres and drawn Jennifer L. Meyer. It’s a lighthearted, exquisitely illustrated book that’s perfect for young readers. Meyer has an impressive talent for drawing animals that emote, and her graceful linework lends an ethereal quality to the story. Aesop’s Ark showcases the diversity of the Monkeybrain lineup, revealing that no genre is off limits as the company moves forward. Monkeybrain’s genesis is the digital-comics equivalent of the formation of Image Comics, and while Chris Roberson and Paul Tobin aren’t superstars like Todd McFarlane and Jim Lee, it’s refreshing to see creators doing comics their own way rather than slaving away at the Big Two for minimal recognition. 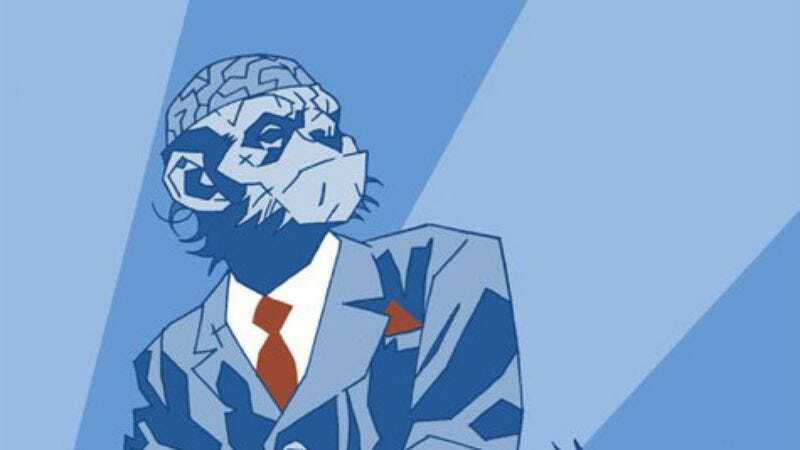 Future Monkeybrain titles include work from established talent like Phil Hester and Bill Willingham and rising stars Joe Keatinge, Brandon Seifert, and Ming Doyle (amongst others), and the overwhelming support Roberson has gained shows that there’s still hope for the struggling comic-book industry if creators are willing to explore new distribution methods. Monkeybrain owns the digital rights to all these comics, but the creators own everything else. They can take the books elsewhere to be printed if they choose, but Roberson also plans on releasing print collections further down the line. It’s a smart, fair business model, and giving creators options helps establish trust between the publisher and its talent. Roberson is doing admirable work with Monkeybrain Comics, and the excitement surrounding its launch suggests that this is the start of something big for the industry.